In 2015 Amaterra provided $1000 for seed funding to support Watershed Management Group’s Sabino Creek Restoration Campaign launch. The campaign’s goal is to restore habitat and surface flow to Sabino Creek, located downstream of Sabino Canyon, the most visited natural area in Tucson. Sabino Creek is located in a shallow groundwater area, where groundwater is 50 feet or less and still supports riparian habitat. This and other shallow groundwater areas are declining as groundwater pumping increases from area residents and as development encroaches. The campaign is a long-term, multi-faceted program including an educational/advocacy program with local residents; on-the-ground restoration efforts in private and public spaces; and policy actions to protect and enhance shallow groundwater areas. Facilitate a stakeholder group to develop a restoration plan for Sabino Creek. Lead watershed restoration workshops in public spaces in the Sabino Creek watershed, such as schools, ranches, or trailheads. Lead hands-on watershed restoration workshops with private residences in the Sabino Creek watershed, focusing on rainwater and greywater harvesting, green infrastructure, and small-scale restoration practices such as one-rock check dams. Partner with four schools to teach our Shallow Groundwater Youth Advocacy Program, including two schools located within Sabino Creek watershed. In 2014 this program was piloted with Western Institute for Leadership Development, a Tucson charter high school. 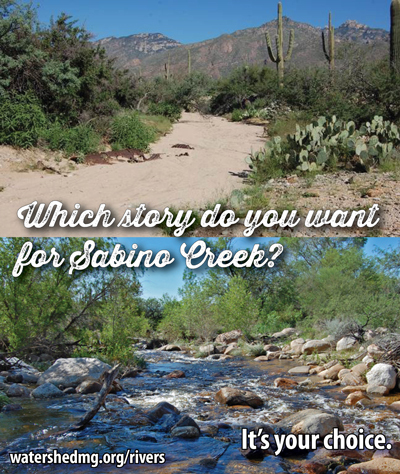 Run a public marketing campaign to raise awareness and inspire action to restore Sabino Creek. Publish the “Get Wet Guide: Sabino Creek,” an interactive guide highlighting recreation opportunities, cultural destinations, wildlife, and ways to protect/restore shallow groundwater areas. Create a series of 3 “Get Wet Videos” about the importance of shallow groundwater areas and a specific call to action for Sabino Creek.